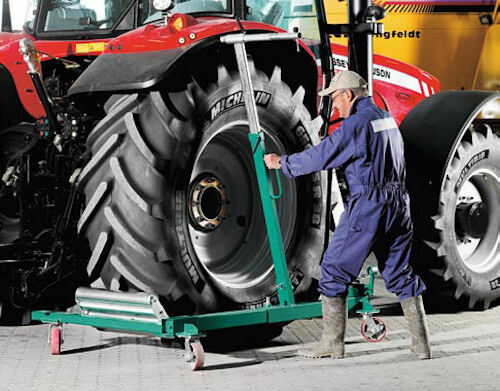 Easy-to-assemble-and-use dolly includes hydraulics to lift and handle large equipment tires. ESCO's new Compac Wheel Dolly is designed for easy and safe demounting and mounting and handling of large tires on agricultural and construction equipment. The new tool is capable of handling wheels from 45.3" to 84.7" in diameter and up to 41.3" in depth, with a lifting capacity of 3,306 lbs. Double-acting hydraulic cylinders allow for hands-free switch from lifting to lowering for a controlled action on and off the axle. The dolly is easily assembled and disassembled and can be used in or out of the shop. For more information on the Compac Wheel Dolly, call (800) 352-9852, or visit ESCO's website at www.esco.net. A big helping hand when you need it, in the shop or out, ESCO's Compact Wheel Dolly handles wheels from 45.3" up to 84.7" in diameter and up to 41.3" in depth.